Washington, DC - Like the three sides of a triangle, ROSCA – the Restore Online Shoppers’ Confidence Act – has three basic compliance requirements for online sellers who enroll consumers in continuity plans, often known as negative options. The law bans online negative options unless the seller: 1) clearly discloses all material terms of the deal before obtaining a consumer’s billing information; 2) gets the consumer’s express informed consent before making the charge; and 3) provides a simple mechanism for stopping recurring charges. An FTC lawsuit alleges that online negative options used by San Diego-based Triangle Media Corporation didn’t give consumers a square deal. It’s a business model the FTC has challenged in numerous cases. Using third-party websites, blog posts, banner ads, and purported surveys, Triangle Media lures consumers in with the promise of a “risk free trial” of a skin cream, dietary supplement, or e-cig. Consumers who respond have to provide their credit card number, but are left with the impression that it’s just to cover the cost of shipping and handling – typically $4.95 or less. But once the defendants have consumers’ credit card numbers in hand, that’s when the FTC says they really go to town. For consumer viewing on a smartphone, that information is buried behind a Terms & Conditions hyperlink. The FTC says the deception doesn’t end there because once consumers click to finish, the defendants send them to a page that says Wait! Your Order is Not Complete! 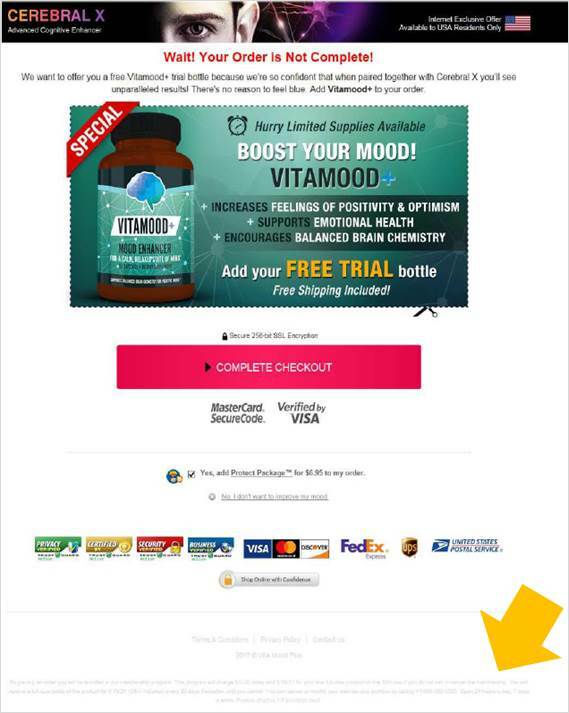 According to the complaint, when consumers clicked the COMPLETE CHECKOUT button, the defendants sign them up for another automatic shipment program involving additional monthly credit card charges of, in this example, $79.31 for a dietary supplement advertised to “increase feelings of positivity & optimism.” An ironic claim given that in our experience, multiple unauthorized credit cards charges aren’t likely to leave consumers with feel-good vibes. In addition, the FTC says the defendants’ restrictive cancellation and refund practices do nothing to boost consumers’ moods. Filed in federal court in California, the complaint charges the defendants with multiple violations of the FTC Act, ROSCA, the Electronic Fund Transfer Act, and Regulation E. The court has entered an order temporarily halting the operation, freezing its assets, and appointing a temporary receiver over the business. The message for marketers is simple: Comply with the ROSCA’s three requirements for online negative options. Clearly disclose all material terms and conditions up front and don’t bury key information in hard-to-find or hard-to-read mouse print or behind obscure hyperlinks. Get consumers’ express informed consent before charging their credit cards. And offer an easy way to stop recurring charges.